I have some experience with Adobe Photoshop by which I made these changes. I hope now the design is much closer to our objective, that is, a perfect poster for My Search History. Post your comments on the new design. I would like to bring you a good news. If you are a 2009 fresher, you could be a lucky one who got placed in Infosys Technologies Limited this year. Yes. Infosys is planning to recruit more than 10,000 freshers this year who are passed out of year 2009. Please forward your updated resume to the email address recruitment@infosys.com and inform this opening to your friends. I know my friend working on .NET development in a company. She wanted me to help her out in an occasion today. 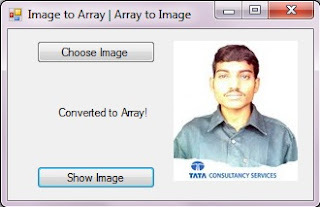 She actually wanted to convert a double array(double) into an image (Image) in C# .NET. I did googling on the this thing and I found something useful for my modifications. You know I do also have little knowledge on .NET. I have Microsoft Visual Studio 2008 installed on my laptop which helped me to do this work. Unfortunately I could not finish this for converting exactly from double to Image. However it is useful for converting byte to Image. Hope the Information is useful! I have Windows 7 Ultimate on my laptop Dell Studio 1555. I searched on Google for setting a Legal Notice Logon Message on Windows 7. I would like to share the experience. Please read it carefully, it is applicable for Windows XP and Vista also. Legal Notice on a computer system is the logon disclaimer message for the authorized use of the system and its resources. It's just a security notice to the users who are going to use the system. Though it is not mandatory for personal and home computers, it is used wide for computers in network, especially in an organization. I explain you the process. 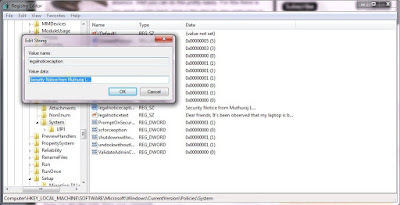 It is done by modifying the Windows Registry Keys. Windows Registry is the heart of the Windows OS which keeps the system and application softwares running by its associated registry values for various properties. Close the Registry by clicking (X) on the top right of the opened window. Restart the system. Now the welcome screen will be the legal notice you created. The fundamental purpose of living is sharing. Sharing anything gives us immense pleasure while sharing knowledge and experience gives us one more life. I started sharing through this blog where you will soon find bigger updates. You will be wasting your golden time by repeating searches. Your basic power of remembrance will be void. You will forget the related keywords which brought you better results on previous search. You will not have a proof of your searches. If you use most related keyword, you will get better results sometimes. This is the only advantage. But if you store your searches somewhere online? Enable web history, by visiting above link. Do googling when you are logged in your Google account. Your web searches will be saved. First of all, we should congratulate Sachin Tendulkar, the Master Blaster of Indian Cricket Team who scored unbeatable 200* in the One Day International match against South Africa yesterday (24-Feb-2010). He is the first cricketer who ever scored double century in ODIs. Kudos to the God of Cricketer! We can not forget the moments he recorded this impossible world record. He scored 200* from 147 balls, taking 25 fours and 3 sixes. It was amazing entertainment watching his blasting batting performance on the ground, Gwalior cricket stadium. The previous record done by a Pakistan batsman and a Zimbabwe batsman had been broken with this outstanding Indian!! We are proud of him. India scored 401 for 3 wickets and won the match easily. As we know, the Master Blaster is the Man of the Match! If Cricket is the religion, Sachin is the GOD! I am Muthuraj Lakshmanan from Chennai, India, a software engineer working in an MNC Company. I am a positive, open-minded, jovial and enthusiastic person. I do the good of my life by living better for the best. I like friendship, that's why I have very little enemies. I believe in goodness, faith, fortune and God. I have very good reasons for my beliefs, that people around me find on me. I often use internet in my office, home and even in travel. As I am basically a computer engineer, I love computers and internet. I always like to spend my spare time on surfing the internet. I thank God, my goodness, I have everything I want in my life. I have a new Dell Studio 1555 laptop, with high end configurations and a Sony Ericsson mobile which keeps me connected online wherever I go. And I am here for doing right thing, right time, helping internet surfers to have better searches over world wide web. I perform more than 50 searches a day over internet, for various needs on my work which is really challenging for me, interesting as well. For my searches, I use different search engines, basically the websites most of us using today. However I am very much fond of Google and its services like Gmail, Gtalk, Orkut, Google Reader, Google Documents etc. I quickly find out the desired results for my search on Google. This is my first blog on blogger.com. In this blog, I would like to share my search experience on technical, non-technical stuff over internet. This is going to be very useful blog for the visitors who wish to spend their online time efficiently. Okay! Let me work for this!! Meet you with regular updates!!! Thank you for visiting mysearchhistory.blogspot.com!